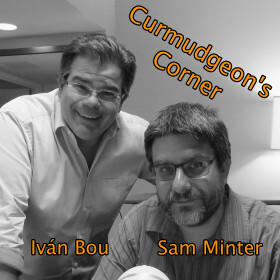 Ed joins Sam on this week’s Curmudgeon’s Corner. Ed educates Sam on the new “Right to Try” law. They discuss if Trump actually has malicious motivations or actually believes he is doing positive things, specifically with regard to how he is handling relations with America’s allies. And finally, they talk about how a complicated story like the Trump/Russia investigation just leaves people confused and tired, while constant repetition of “witch hunt!” is a simple clear message that penetrates to those who are inclined to believe it. Yet another full show! 05:23:45 Retweeted @timnelson_mpr 05:18:28 Here’s your midnight update: The #mprraccoon is moving…laterally. Still on 17th floor, making its way around the building. 05:52:25 Retweeted @ASmallFiction 05:41:07 Dog worried when his people left.They were bad smellers. What if they couldn’t smell a way home? 01:05:00 There ya go. Two dumbasses. 03:13:39 Retweeted @PhilippeReines 01:46:14 If you‘re Kim Jong Un and your entire experience w America is Donald Trump & Dennis Rodman, would you give up your nukes? 07:10:15 Retweeted @prchovanec 06:46:43 I honestly didn’t know what to expect. 22:01:42 I know #mprraccoon is probably not going to end well, but I can’t help from checking every 15 minutes or so. 08:44:54 Retweeted @Carpedonktum 2018-06-10 20:25:09 Kim Jong Un shows respect for President Trump by playing “Rocket Man” during the opening ceremony. 21:20:29 Retweeted @HoarseWisperer 21:02:08 Hi @JustinTrudeauSorry to bother you with this. Was just on the Canadian gov site.